Declining calcification and accelerating sea-level rise have brought us ever closer to the point where coral reefs may not be able to keep pace. Even if this is insufficient to change reef-community structure or totally overtop low reef islands in the twenty-first century, the impacts on reefs and the organisms that depend on them will still be profound. Patterns of sea-level rise have varied spatially in the past due to both local tectonics and regional crustal responses to deglaciation. The result has been regionally disparate sea-level histories that complicate our understanding of the links between past sea level and reef development. At the same time, gaps remain in our understanding of how, and how fast, reefs build. Holocene reefs-accretion rates (generally <5 mm/year) are lower than previous estimates (10–15 mm/year), making coral reefs more vulnerable to rising sea level than has been assumed. 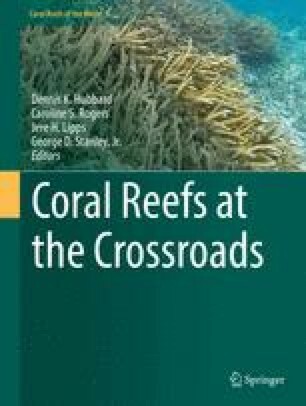 Furthermore, the conflation of coral growth and reef accretion has provided an overly simplistic view of reef building that focuses on coral abundance and calcification. Protocols have been suggested to quantify the changing balance between carbonate production and bioerosion, but these still ignore the role of physical processes that redistribute and remove material from the reef, a scenario that will become even more important as the intensity of tropical storms increases. Holocene cores show that accretion does not mimic the depth dependence of calcification, suggesting that predictions based solely on biological assessments could be flawed.